Conversations surrounding the use of social media marketing and recruitment often include an assessment of the pros and cons of its popular use in a generation that’s grown #happy. The key here is that social media is cemented into our culture and become a place where people spend significant parts of our day. Social media is a key component of building a brand, spreading awareness, and bringing in qualified candidates, customers, and clients. Is your company taking advantage of this great exposure? Despite its grand appeal to a diverse audience, entry into this realm continues to be a daunting task for many organizations. In my experience, there is a reluctance surrounding the idea of putting something “out there” to a vast audience in fear of how people might react. People worry about the backlash of the wrong status update and/or interacting with audiences that may not be particularly receptive to their message. The truth is, this can happen no matter what. However, the benefits outweigh the negatives here. Messages about companies are floating around whether they participate in social media or not. If you want to participate in conversations related to your company, you need to be on social media. By actively contributing to social media in a professional manner, you maintain ownership of your image, gain control over the message, and are given the chance to interact with followers of your brand. 3. Clear numeric indicators of brand-building and reach with a recording of click-throughs, likes, etc. Whether your organization has already started using social media and would like to revisit your approach or has just started to contemplate using it, there are some steps that can assist in the ramp-up. 1. 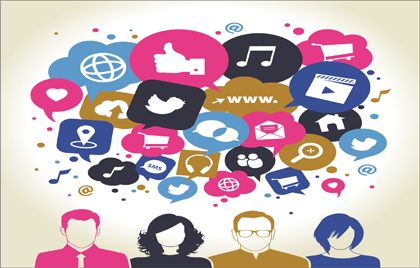 Develop a social media policy for your company. The policy should reflect your company’s business environment and goals for using social media. Choose which social media sites will work best for your company. It doesn’t just have to be Twitter, Facebook, or Google+. In fact, a more niche site might work even better for your business. Dedicate one person to create content and monitor activity on social media for best results – it really is a full-time job. Include guidelines on what degree non-company members will be able to post publically (i.e. comments on a wall). Whenever possible, a legal review of the policy is recommended. 2. Create an outline for the rollout of your social media campaign. The outline should include examples of what material will be posted, the frequency you plan to post to each social network, and the proposed time for these posts. Do your research and make sure your content is relevant to your target audience and that you’re posting at times when they are active on social media. Decide what your measure of success will be. It makes strategic sense to have a system in place for counting “clicks” and “likes,” for example. Many social media platforms have their own analytics built in. Use these metrics and some of your own to report back on effectiveness. Review results on how your team measured against the goals you set for your campaign. Did you measure up to your definition of success? Where did you fall short? This is also a good time to make any necessary changes to your strategy and pivot from there. Don’t use sales content – aim to build relationships. Use images, infographics, and videos to make your posts eye-catching. Use third-party resources and be sure to source the information. Keep in mind that all things new include an adjustment phase. Being patient with yourself and your company as you adapt to using social media will go a long way making a positive leap in the growth of your company. Deborah is the Client Relationship Director at iCIMS where she provides ongoing proactive follow-up to iCIMS customers and delivers a customer experience that is second-to-none. Please visit www.icims.com for more information!